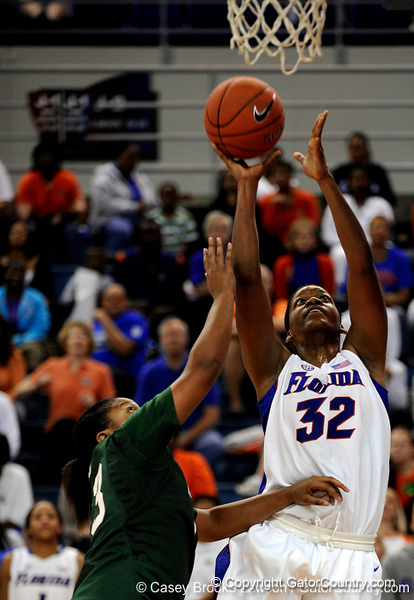 Playing their first games in Florida uniforms, freshman Jennifer George and sophomore Jordan Jones combined for 38 points to direct the Gators to an 85-63 season-opening win against in-state foe Stetson on Saturday in the Stephen C. O’Connell Center. The Gators (1-0), who won their 17th consecutive non-conference home game, shot 50 percent (33-of-66) from the field in the game, making seven 3-pointers, and out-rebounding the Hatters (0-1), 35-30. Florida came up with 14 steals in the game. George turned in the third-best offensive performance by a Gator in her collegiate debut, finishing with a game-high 21 points, including 7-of-9 from the floor to complement five offensive rebounds in just 16 minutes of play. Jones, playing her first collegiate game in 601 days after transferring to Florida from South Carolina, tallied 17 points – including three 3-pointers - to go along with a game-high five assists and two steals. Senior forward Sharielle Smith finished just shy of her third career double-double, tallying nine points and a team-high nine rebounds. Senior guard Steffi Sorensen, who made her team-high 32nd consecutive start, tallied eight points, six rebounds and came up with a career-high six steals.